"If Count Basie had hired James Brown to replace Joe Williams as his featured male vocalist, what would the results have sounded like? Brown offers some suggestions on Soul on Top, which finds the Godfather of Soul making an intriguing detour into jazz-minded big-band territory. Recorded in 1969 and reissued on CD in 2004, Soul on Top unites Brown with the Basie-influenced orchestra of jazz drummer Louie Bellson -- and stylistically, the results are somewhere between soul-funk and the funkier side of big-band jazz. This Brown/Bellson collaboration isn't straight-ahead jazz; nor is it typical of Brown's late-'60s output. But if recording a big-band project with Bellson was a surprising and unexpected thing for the Godfather of Soul to do in 1969, it was hardly illogical or bizarre -- Brown, after all, grew up listening to jazz (as well as blues and gospel) and was well aware of the legacies of Basie, Lionel Hampton, Duke Ellington, and others. Besides, jazz and R&B are closely related. While some jazz snobs would have listeners believe that jazz and R&B have little if anything in common, the fact is that they're close relatives that get much of their energy and feeling from the blues. 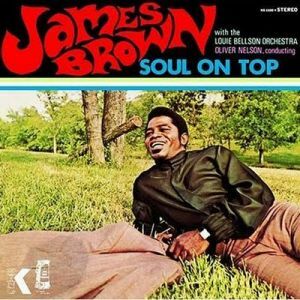 So it makes perfect sense for Brown to combine soul, funk, and jazz on this album, which finds him revisiting some major hits (including "Papa's Got a Brand New Bag" and "It's a Man's Man's Man's World") in addition to embracing "September Song," "That's My Desire," and other standards that one typically associates with jazz and traditional pop. Although not among the Godfather's better-known efforts, this fine album is happily recommended to anyone who holds R&B and jazz in equally high regard." great record and great blog...and triple thanks for the liner notes and comments! great blog yes! funk & soul forever! thanks!